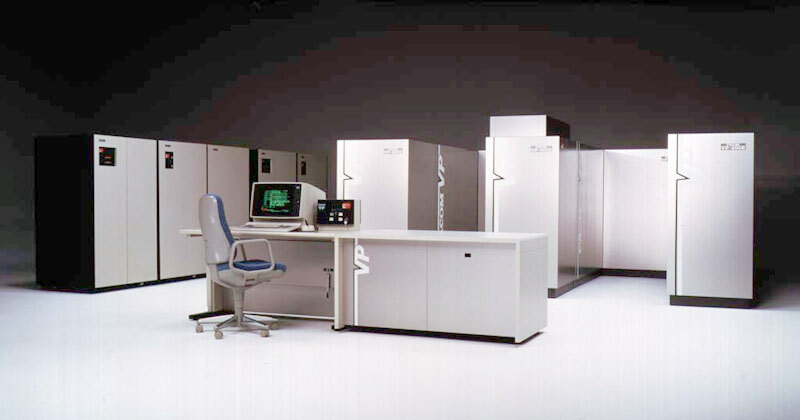 The five E Models of the FACOM VP Series (FACOM VP-30E, VP-50E, VP-100E,VP-200E and VP-400E) were announced in July 1987 as enhanced versions of Fujitsu's FACOM VP-100 Series of supercomputers. These E models achieve performance 1.5 times that of the previous FACOM VP-100 Series machines by adding high-speed vector memory and adding an arithmetic pipeline. This Series was the first in the world equipped with virtual computer capability, and this enabled use even in the UNIX environment. *1: By adding the VSU to the main memory, the max. 256MB real memory area could be expanded up to a maximum of 1GB (that was amount of main memory capacity and VSU capacity) in vector processing.